If you love ice cream, try this recipe. Fresh blueberries and orange juice are blended with a basic cream mixture to make a fantastic dessert. Add toasted pecans for a little crunch. In a medium saucepan, bring blueberries, the 1/2 cup sugar, the 1 teaspoon of orange peel, orange juice, and salt to boiling over medium heat, mashing berries and stirring with a fork; reduce heat. Simmer, uncovered, for 5 minutes, stirring frequently. Remove from heat; cool slightly. Remove 1 cup of the mixture; set aside. Transfer the remaining blueberry mixture to a food processor or blender. Cover; process or blend till almost smooth. Pour blueberry mixture through a fine mesh sieve into a medium bowl, pressing on solids with back of a spoon; discard solids. Add the reserved 1 cup of blueberry mixture and the 1 cup of whipping cream to sieved mixture. 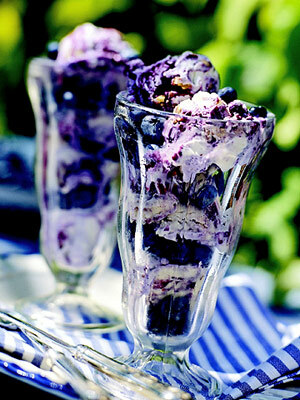 Cover; chill blueberry mixture in the refrigerator at least 4 hours or up to 24 hours. Meanwhile, in a large saucepan, stir together the 1-1/2 cups sugar and flour. Gradually stir in milk. Cook and stir over medium heat until slightly thickened and bubbly. Cook for 1 minute more. Stir about 1 cup of the hot mixture into beaten egg yolks; return to remaining hot mixture in saucepan. Cook and stir just until mixture returns to boiling. Remove from heat. Stir in vanilla and cardamom or cinnamon. Cool slightly. Cover the surface with plastic wrap. Chill in the refrigerator at least 4 hours or up to 24 hours. In a chilled large mixing bowl, beat the 3 cups whipping cream with an electric mixer on medium speed until soft peaks form. Gently fold the whipped cream into the chilled milk mixture. Spoon mixture into the freezer can of a 4- or 5-quart ice cream freezer. (The can should be no more than two-thirds full.) Freeze the ice cream according to manufacturer's directions. Using a sturdy rubber spatula, fold in the blueberry mixture, remaining orange peel, and, if you like, the pecans until just swirled. Ripen; transfer to a freezer container. Freeze to store. Makes about 2 quarts (16 to 18 servings).